Khiva Alibek v Khiva, Uzbekistán: Zarezervujte nyní! 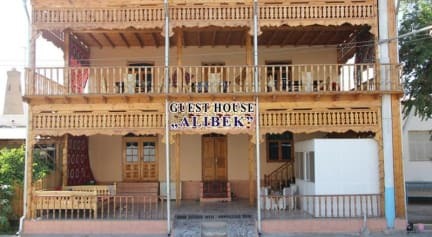 Alibek Guest House (Alibek Hotel in Khiva) Located at Khiva city, Uzbekistan Republic. It is a nice property suitable for everyone. We have taxi service, air conditions in all rooms. You can see the old Khiva city from our window. Because very near, from our location just 50m walk from old Khiva town. The staffs speak your language! Bed and breakfast: 8 rooms. Free WiFi and free private parking are available on site. Meanwhile we can offer walking tour along Ichan-Kala museum reserve. The location is very near to Main Gate (one of the four gates of surrounded Ichan-Kala museum reserve).